Growing up, my parents taught me the importance of a thank you card. After every birthday or holiday, they would have me sit down and write a thank you to send out to family members. During my younger years, I will admit that I hated writing them. But I now see the importance of saying thank you or writing a personal note to someone. I think I actually look for reasons to write a thank you note to someone. I even stock up on thank you cards when I see ones I like at Home Goods! It doesn’t even have to be a thank you card. Any excuse for me to reach out to those I appreciate in my life I try to do so, even if it’s just to say hello. I know how happy it makes me to get a handwritten note in the mail, so I do my best to share that feeling with others. I’ve learned that people don’t necessarily remember what you say, but they always remember how you made them feel. If you shared a cup of coffee with someone, received some incredible advice, or simply enjoyed the time spent with someone let them know in a handwritten note! 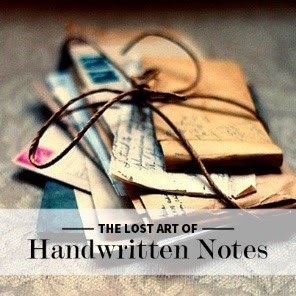 Handwritten notes are so much more personal, not to mention more rare, so they're very much appreciated. It doesn’t have to be perfect, but make sure that it is personal and heartfelt. If you think you are too busy, or that no one writes notes anymore – you are wrong, my friend. It takes a short few minutes to write a note, copy down an address and stick a stamp on the envelope. And while technology has certainly made communication easier, electronic communication has not replaced writing a note by hand. Take a break from your hectic schedule and reach out to someone you love. I promise that they will feel appreciated if you do!